We can provide you with a discounted parking voucher (currently £1 per day) which allows you to park on the seafront opposite our property or in nearby streets, in ‘Pay & Display’ parking bays, zone H. When you arrive, simply pop in to pick up a voucher, which you then display in your windscreen. Will I have 24-hour access to my room? Yes, at check in we provide you with a key card which allows access at all times. You may check in until 8.00pm, later by prior arrangement only. Check in after 10pm is not possible. Please advise us of your approximate arrival time if possible. No, we do not have a lift due to the age and design of the property. 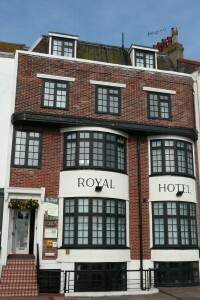 Bedrooms are arranged on three floors. If you require a ground or first floor room please enquire before booking. Do you offer wheelchair/disabled access? There are seven steps from the street to our front door so unfortunately, unless the wheelchair is collapsible, access is limited. Our ground floor Travers Suite may be suitable for less mobile guests, please telephone for more information. Do you provide covered bicycle storage? Yes, we can store your bicycles safely in our basement during your stay at no charge. How do I book accommodation with you? The easiest and most secure way to book is online via this website. Simply click the blue ‘Book Online’ button which appears on the right-hand side of each page. Alternatively you may telephone us to book on 01323 649222. If you book online through our website, the full amount for your stay will be charged to your card at time of booking. An amount equal to the first night of your stay is non-refundable. If you cancel 60 days or more before your arrival date, the balance (less first night) will be refunded to your card. If you cancel 59-30 days before your arrival date, 50% of the total amount of your stay will be refunded. If you cancel 0-29 days before arrival date, no refund will be payable. We highly recommend that you take out travel insurance, available from all good brokers. Is there a hairdryer in my room? Tea and coffee making facilities? An iron? Every room has a hairdryer and tea and coffee making facilities. An iron and ironing board is available for your use, please enquire at reception. I am allergic to feathers, what sort of bedding do you use? We do not use any feather bedding or filling in pillows or cushions due to allergy and animal welfare concerns. All fillings are manmade and hypoallergenic. Which television channels are available? All our TVs have Freeview, offering 50+ channels. A list of available channels and radio stations is available in your room. Many of our televisions also have built in DVD players. Our substantial continental breakfast consists of fruit juice (freshly squeezed to order), proper coffee or a choice of teas; fresh fruit salad, various cereals including homemade organic muesli, yoghurts, cheeses, croissants, breads, including homemade bread, a selection of homemade preserves and usually homemade muffins or cake too. Can you provide vegetarian/vegan/gluten-free/lactose-free food? Everything served at breakfast is suitable for vegetarians. We always have vegan options, spreads, soya milk and soya fruit yoghurts available. We have gluten-free cereals including special homemade (oat-based) muesli and can provide gluten-free bread if requested in advance. Organic, free range eggs cooked to order are available for an additional charge. Bacon – sorry, no, we do not serve any meat or fish. If you prefer a meat-based breakfast, you are welcome to reserve accommodation on a room-only basis at a reduced rate and take breakfast at one of the many nearby cafes. We do not serve evening meals as we are located in the centre of town, with a huge variety of restaurants, pubs and cafes within easy walking distance. We are always happy to recommend local restaurants based on your own preferences and previous guests’ feedback. We love having dogs to stay and, as long as the size of the room allows, you are welcome to bring more than one dog. For larger breeds, we advise our Travers Suite, which is spacious and contains a sitting room. Please ring us for more information. Your dog sleeps in your bedroom. Dogs are allowed in all rooms. Alas, we have heard many tales of ‘dog friendly’ establishments insisting on dogs sleeping overnight in their owners’ cars or in a kennel outdoors. At The Royal we do not discriminate against our canine guests. They sleep in their owners’ bedrooms and are welcome in all public areas. Should I bring my own dog bowls and pet bed? We provide a water bowl in your room and can also provide an additional bowl for food, however most guests bring their own. We have dog blankets available, but most guests prefer to bring their own pet bed or blanket, as the scent of home helps dogs feel more secure in an unfamiliar environment. Again, most guests bring their own dog food. If you are arriving by public transport, for example, and would have difficulty carrying dog supplies, simply let us know in advance and we’ll be happy to buy some of your usual dog food for you, charged only at cost price. Where can my dog do his ‘business’? 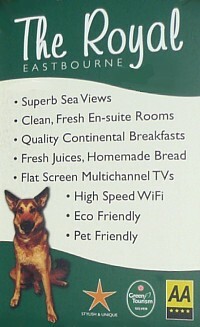 We are located directly opposite a dog friendly beach. The beach is shingle but is sandy at low tide. There are also small grassed areas in the vicinity and a large park ten minutes’ walk away. Please ensure that you always clean up after your dog. What if my dog gets muddy and wet? Please ask us for a dog towel. We have a large supply. Are there many good long dog walks in the area? Yes, there are some wonderful countryside and beach walks, please ask for information at reception. Special note: when walking up on Beachy Head, please ensure that your dog is kept on a lead. The cliff edge is not fenced and unfortunately a number of dogs fall to their deaths each year. Can my dog come down to breakfast with me? Certainly, your dog can accompany you to breakfast. All we ask is that they stay on a lead and are well behaved. Can I leave my dog in the bedroom if I go out? Yes, if you are confident that your pet will settle and won’t howl/bark/chew while you are away. Please let us know when you leave a dog in your room so that we are aware, for cleaner, etc. If you intend to go out for a long period, please discuss dog-sitting with us. If going out to eat, we can recommend some good local cafes and pubs which are dog friendly. Your dog sitting service. How does that work? This depends on the needs of the dog. We are always happy to keep an eye out and pop into your room every now and again to make sure your dog is content while you are out. There is no charge for this. If you agree, and we are not too busy, we can also bring your dog down to sit in reception or downstairs with us. If your dog is of a more nervous nature, and is likely to be worried by being left alone, we offer a more dedicated dog-sitting and walking service: we usually hire someone in for this, an experienced dog minder who will keep your dog company at all times, and also take them out for a walk or whatever else is needed according to your individual instructions. The dog sitter charges £7.50-£10 per hour, with a two-hour minimum, and we need to book her services in advance. Doggy pampering and massage: we’ve recently started working with a qualified professional dog therapist, offering canine pampering and massage, whether for muscle ailments or simply for relaxation. There is also a Canine Hydrotherapy pool nearby. More details under Pet Friendly tab. Do you accept other types of pet? Generally yes. Please ring us to discuss.